Two freely selected cards magically appear at two freely named numbers! The deck itself correctly reads a spectator’s mind, four times, to reveal her selected card – and discovers the matching four-of-a-kind as well! One spectator freely chooses and pockets two cards, whose identities remain unknown. From a second, shuffled deck another spectator freely touches two cards – and both cards match the first chosen pair! Aces assemble one-at-a-time, and then all appear under the spectator’s hand – with no extra cards and no palming! Predict the exact location of two freely cut and replaced cards! An all-new, in-depth look at the Aronson Stack, with over 25 new effects that require no memorization and retain the entire stack intact! BONUS EFFECT! 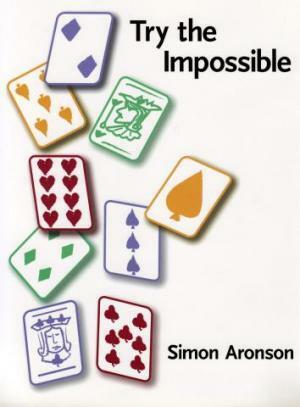 Although Try the Impossible was intended to be an "all card" book, at the last moment Simon was persuaded to reveal "Ringleader" – Simon’s incredible finger ring through rubber band routine. In the book, nine pages of text and over 20 photos help explain one of the most visual pieces of magic you’ll ever see! To download and view a FREE MOVIE CLIP of Simon’s performance (Real Player 8 required) click here. SPECIAL OFFER –––– Two of the effects in Try the Impossible make use of special gaffed cards. Simon has arranged to have the necessary special cards printed by U. S. Playing Card on red-backed Bicycle stock, and to make these gaffed cards separately available under the name "Aronson’s Aces." A set of these gaffs costs $10. But you’ll receive a set of these specially printed cards ABSOLUTELY FREE if you order your book directly from Simon! A spectator freely names any card. A second spectator freely touches any card – which matches the named card! And the performer never even looks through the deck! 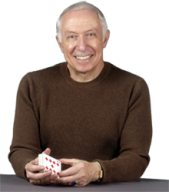 Control two freely selected and replaced cards to virtually any two positions you desire – without any sleight-of-hand! Imagine dealing five strong poker hands, each better than the previous one, with the dealer receiving a Royal Flush in Spades – and being able to instantly repeat it again and again, with no resetting!